The two-stage rocket, with a hydrogen-fueled core and two solid rocket boosters, lifted off at 2037 GMT (3:37 p.m. EST; 5:37 p.m. French Guiana time) Tuesday from the ELA-3 launch zone at the Guiana Space Center, a European-run spaceport on the northeastern shore of South America. After a problem-free countdown, the Ariane 5 lit its Vulcain 2 main engine, waited seven seconds for the powerplant to throttle up and run though a computer-controlled health check, then ignited the pair of solid-fueled boosters and vaulted off the pad, climbing through partly cloudy skies and breaking the sound barrier in less than a minute. The 179-foot-tall (54.8-meter) rocket arced toward the east over the Atlantic Ocean, jettisoned its two spend booster casings nearly two-and-a-half minutes into the flight, then released its clamshell-like Swiss-made nose cone about a minute later. The Vulcain 2 main engine shut down and the first stage separated around nine minutes after liftoff, and a cryogenic HM7B upper stage engine fired for a nearly 16-minute burn to inject the GSAT 11 and GEO-Kompsat 2A satellites into an elliptical geostationary transfer orbit, ranging from around 155 miles (250 kilometers) above Earth to a maximum altitude of approximately 22,220 miles (35,760 kilometers). GSAT 11 separated from the launcher first, around 29 minutes into the mission, followed a few minutes later by deployment of GEO-Kompsat 2A. Both satellites — developed by the Indian Space Research Organization and the Korea Aerospace Research Institute — are destined for geostationary orbit, a position more than 22,000 miles (nearly 36,000 kilometers) over the equator, where the spacecraft will circle the planet at the same rate as Earth’s rotation. 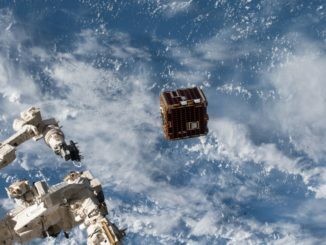 The orbit is favorable for communications and weather observation because it allows satellites to remain over a fixed geographic area 24 hours a day. 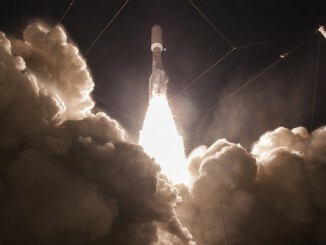 Arianespace, the French company charged with overseeing Ariane 5 commercial operations, declared the mission a success. Tuesday’s launch was the sixth Ariane 5 flight of the year, a campaign that began with the off-target deployment of the SES 14 and Al Yah 3 commercial communications satellites Jan. 25. Investigators blamed that incident, which ended a streak of 82 straight flawless Ariane 5 launches since 2003, on a programming error in the rocket’s guidance system. The Ariane 5 flew as designed according to the wrong navigation targets, and both satellites separated in unexpected orbits. SES 14 and Al Yah 3 recovered from the orbital injection error, requiring them to consume additional on-board propellant to do so, and are now in commercial service. Since then, the Ariane 5 has accomplished five consecutive successes, including commercial communications satellite launches, the deployment of a quartet of European Galileo navigation payloads in July, and the launch of the European Space Agency’s BepiColombo mission to Mercury in October. Arianespace also conducted the 100th Ariane 5 launch overall in September. Arianespace is ending the year with a series of launches from the space base in Kourou, Frenh Guiana, approximately every two-to-three weeks using the company’s family of Ariane 5, Soyuz and Vega rockets. After successful launches Sept. 25, Oct. 19, Nov. 6, Nov. 20 and Dec. 4 — using all three of the company’s launchers — one more mission is left on the manifest this year. The first in a new generation of French government spy satellites is set for launch Dec. 18 on top of a Russian-built Soyuz rocket from French Guiana. 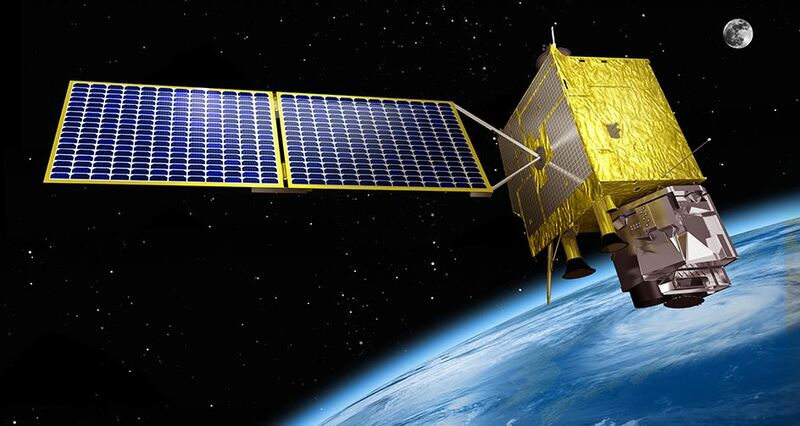 The Composante Spatiale Optique satellites are the successors of France’s Helios reconnaissance satellites, providing high-resolution global imagery to French intelligence agencies and military leaders. 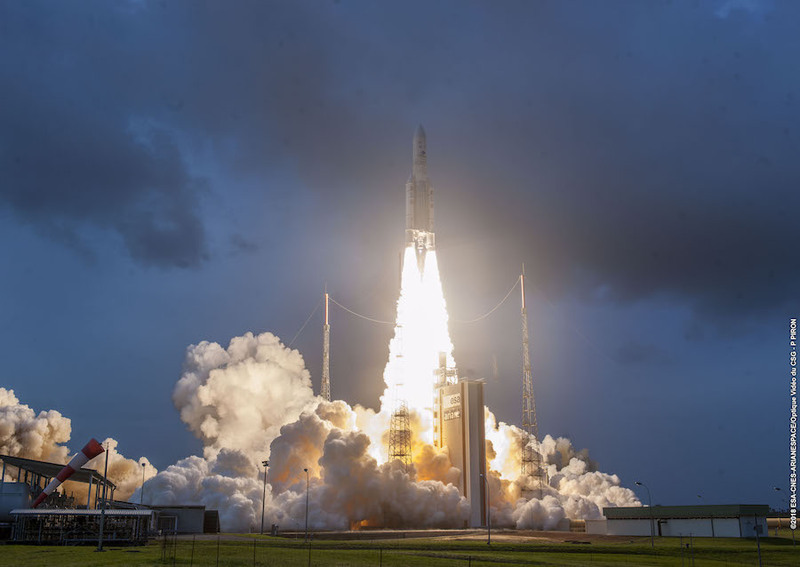 The GSAT 11 communications satellite was the bigger of the two payloads launched aboard Ariane 5 on Tuesday. With a launch weight of 12,906 pounds (5,854 kilograms), GSAT 11 was built at ISRO’s satellite development center and is the heaviest spacecraft ever manufactured in the country, using India’s new I-6K satellite bus design. 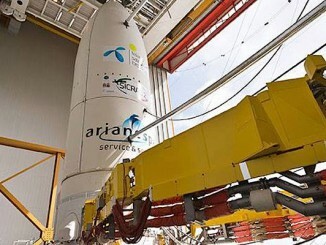 GSAT 11 was supposed to launch on an Ariane 5 rocket in May, but ISRO decided to return the satellite from the launch base in French Guiana to India for additional inspections after a different communications spacecraft failed soon after a launch on an Indian rocket in March. ISRO’s decision caused GSAT 11 to miss its launch slot in Arianespace’s manifest, and it forced the French-headquartered commercial launch provider to re-plan its Ariane 5 manifest this year. Ariane 5 rockets typically launch with two large communications satellite at a time on missions toward geostationary orbit, allowing different customers to share launch costs. GSAT 11’s original co-passenger — the Azerspace 2/Intelsat 38 communications satellite — was ready for a launch in late May, but had to wait until September for an Ariane 5 flight, when a new co-passenger became ready. ISRO declared GSAT 11 ready for launch, and the satellite arrived back in French Guiana on Oct. 26 aboard a cargo plane for final launch preparations. The high-power GSAT 11 spacecraft carries Ku-band and Ka-band relay payloads, and is designed to provide broadband connectivity across India and neighboring regions, offering major capacity upgrades over India’s existing communications satellites. GSAT 11 will be positioned in geostationary orbit at 74 degrees east longitude over the equator for its 15-year mission. It was India’s 22nd satellite launched by Arianespace in a relationship dating back to 1981. South Korea’s GEO-Kompsat 2A weather satellite launched in the lower berth of the Ariane 5’s dual-payload adapter structure. The 7,732-pound (3,507-kilogram) GEO-Kompsat 2A spacecraft is South Korea’s first dedicated geostationary weather satellite, following the launch in 2010 of a multipurpose geostationary spacecraft with meteorological, communications and marine surveillance payloads. GEO-Kompsat 2A is heading for a geostationary orbital slot 128.2 degrees east longitude, where it will take position for 10-year mission surveying weather systems, cyclones and other phenomena across the Asia-Pacific region. Built at KARI’s facility in Daejeon, South Korea, the GEO-Kompsat 2A satellite carries the Advanced Meteorological Imager, a 16-channel camera built by Harris Corp. in Fort Wayne, Indiana. The imaging instrument is similar to Harris-built cameras flying on NOAA’s new generation of U.S. GOES geostationary weather satellites, and Japan’s Himawari meteorological observatories. The new imaging capability enabled by GEO-Kompsat 2A satellite and Harris-built camera will give forecasters three times the imaging channels and speed of observation offered by South Korea’s previous weather satellites, according to Harris. The South Korean government is funding development of two new geostationary environmental satellites. While GEO-Kompsat 2A is for operational forecasting, the GEO-Kompsat 2B satellite is designed for maritime observations and pollution monitoring after its launch on another Ariane 5 flight next year. The South Korean government’s budget for the two-satellite program is roughly 720 billion won, or $650 million, officials said in 2015 when they announced Arianespace’s contracts to launch the two spacecraft.